During the summer of 1951, excited young couples received the keys to the first completed houses in Stevenage – and began a new experience in town living. The first street to be occupied was Broadview which now bears a special sign to commemorate the arrival of the first residents. Although the town has changed over the years,we still have all the original features in our house, and much of the same furniture,which is testament to how well built they are. Many of the new arrivals came from London which had suffered greatly from the nightly bombing.One lady who lived in a one bedroom flat in Westminster with her husband and two children recalls that the sun was shining as she moved into a new home in Stevenage surrounded by countryside .There were no shops at first in fact nothing much at all.From the top of Abbotts Grove all you could see was the tips of pine trees. 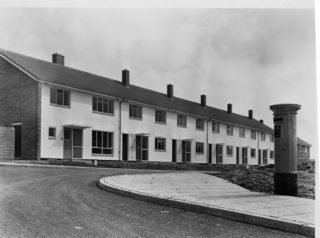 Seeing an advert for housing in Stevenage while sitting in his work canteen her husband had jumped at the chance to apply for a house.There was stiff competition for each property with up to five families applying for the same home. 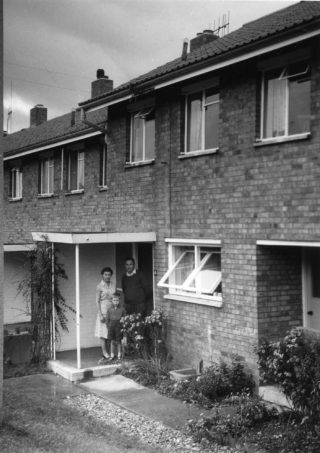 The cost of moving the family to Stevenage was £4 10s (£4.50) whilst £1 15s and 6d (about £1.77) was paid weekly in rent.They were paying 15s rent for their flat in London but got a three bedroom house in Stevenage for just a pound more. The vision of Stevenage New Town became a landmark influence on the way that modern towns have been designed…there’ s a strong sense of community in each of the neighbourhoods and it’s great to see that many of the original residents have stayed in the town. We look forward to seeing how the town will grow and communities continue to develop for future generations. If I’ve got the angle of the top photo right, the corner house was occupied by the Babb family. Their sons were friends of mine. I lived in the next street, Brox Dell. A couple of doors down was the Perkins family, and further down towards Claymores, was the Eldridge family. We arrived at our new house in Whomerley Road on the last day of 1951 after having lived in a downstairs flat in North Finchley. My dad had worked as a bricklayer for Terson’s building the Monks Wood neighbourhood. No paved roads, no pavements, no bus service (the no. 392 didn’t start for about another year) and the shops were in the Old Town which was reached on foot along grassy paths through the fields. Shortly afterwards though, Lawrence Guard, who had a grocery shop in Albert Street, began to bring a van of groceries round and parked on Rockingham Way, about where the present shops are situated. My mum used to complain about him upping the prices – well he had added overhead, I suppose. Rockingham Way shops, along with the Twin Foxes pub opened around 1954 and the same Lawrence Guard then had permanent premises there.